Designed to inspire, connect, and empower moms to live and raise a happy, healthy family. 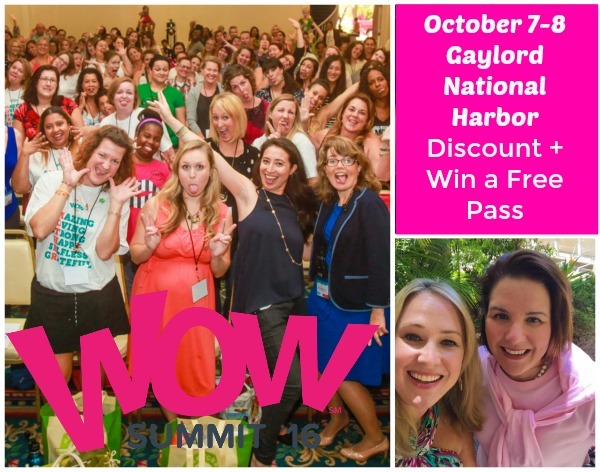 I am so excited to attend my first #WOWsummit in October here in DC…and I hope you will join me! I have an exclusive discount code for everyone, and am also giving away one General Admission Saturday Pass! Conferences with fellow mothers and women focused on improving the health of their families and learning more about being savvy in business and persona life are so inspiring and worth it. I am looking forward to taking two days to focus and connect on my goals. I completely recommend that you join me! At the #WOWsummit we will experience two days of learning, exploring and connecting with fellow mothers who are focused on bettering ourselves, our families’ health and our businesses. We will hear speakers plugged-in to online success and influence, as well as network with leading brands who want to connect with and work with moms like us. And of course, I cannot resist a great expo floor, packed with samples, swag and the chances to meet with family-friendly brand reps. #WOWsummit sponsors include National Geographic Kids, Solgar, Tasty Bite, Mary’s Gone Crackers, KIWI magazine, and more health-minded and family-focused companies. In the exhibitor hall we will experience top-notch, natural, eco-friendly, organic, and better-for-you brands … and take home oodles of samples. Enter to win a pass by filling out the form at the end of the post! The Friday workshops from 1pm-5pm will help us excel and grow online. We will attend workshops led by successful bloggers and industry experts. Laura Harders, Beltway Bargain Mom, will be leading a workshop on Blogging Authority: How to Master the Media and Gain Credibility that I am looking forward to attending. We will also have the chance to experience speed-dating-style networking with big brands for sponsorships. At the end of the day, there will be a Cocktails and Comedy hour which I know will be an awesome MNO (Moms’ Night Out) with the new connections we have made. You’ll receive a deluxe welcome bag, as well as extra raffle tickets, plus access to the Cocktails and Comedy hour night out and drink tickets, as well as all the perks of the Saturday General Admission Conference. Saturday is all about learning how we all can navigate a healthy lifestyle for ourselves and our families. We will meet other women on a journey for improved health and a more natural lifestyle. We will discover better-for-you products, attend educational workshops. The general admission pass includes admission to all general sessions, workshops, and product sampling in the Exhibitor Hall. And at check in for all passes, we receive a WOW Summit t-Shirt, a goodie bag with $100 worth of products inside and 5 raffle tickets for prizes given out at the conference. I’d love to attend — am always looking for ways to find a healthier me and a healthier family. I would love to attend to learn about leading a healthy lifestyle for myself and my family.